While no one enjoys being shunned or ignored, everyone seems to respond to this in their own way. 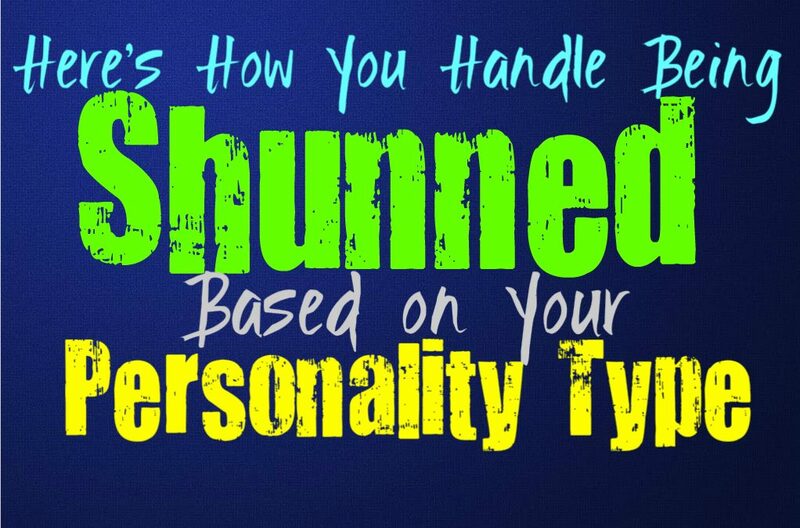 Here is how you handle and respond to being shunned, based on your personality type. INFJs definitely don’t like feeling shunned, especially by those they once felt close to. When this happens they can sometimes blame themselves, feeling like they aren’t good enough. Rejection is definitely difficult for INFJs, since they already put a lot of pressure on themselves to be lovable and valuable. This is something that often takes meeting the right people for the INFJ to truly understand that it simply is not their fault. When they finally find people who understand and appreciate the INFJ, it helps them learn to disconnect from those negative individuals and stop blaming themselves so much. ENFJs definitely don’t like being shunned, and might take this as a challenge in some ways. They will likely try to overcome this struggle so that the people shunning them change their minds. ENFJs are often likable people who know how to adjust their own behavior in order to be perceived differently by others. This is something they often will do in their younger years, since they don’t want to be shunned or rejected. As they get older the ENFJ will learn to stop blaming themselves and start searching for people who truly appreciate them. INFPs can definitely struggle with feelings of rejection, and being shunned often makes them retreat inward. They can feel like it is their own fault, but they often overcome these feelings in some ways. The INFP will start to realize that they are simply different, and that many people don’t understand or appreciate who they are. When they discover people who appreciate them, it helps the INFP overcome these negative emotions. They will eventually realize that they need to move away from people who shun them for being who they are, and lose the desire to waste energy on those types of people. ENFPs definitely don’t appreciate being shunned or ignored, and become a bit frustrated when this happens. They strive to be liked by others and often don’t understand when people do not like them or want to be around them. The ENFP might blame themselves at first and will try even harder to make this person like them. After a while the ENFP will start to understand that they cannot change people and shouldn’t waste their energy on them, but it takes some time for them to come to terms with this. ENFPs are often charismatic and lovable people, who struggle with being shunned or ignored. INTJs don’t really care much when they are shunned by people, since they don’t mind ruffling a few feathers. They speak their mind and prefer to spread the truth wherever they can, if people cannot handle this they won’t waste their time on them. When someone shuns the INTJ for simply being truthful, they realize this person likely is not worth their energy. INTJs might become upset when this comes from someone they care for, but at the same time they don’t believe in chasing after people who don’t give them respect. ENTJs aren’t really fans of being shunned, and in some situations might demand attention. If they need to communicate with this person for important reasons, they simply won’t accept their behavior or silence. When ENTJs are being shunned by someone they often want to call them out at first, simply because they aren’t afraid of taking on a little discord. When this continues to happen the ENTJ will likely come to terms with the fact that this individual is no longer worth wasting their time on. INTPs don’t enjoy being shunned, but they often try to take this without getting too upset. It will likely bother them inside but the INTP doesn’t want to express this outwardly. If someone shuns them they might simply move on from this person, instead of wasting their time and energy trying to make amends. If it someone the INTP truly cares for though, they might attempt to figure out why they are being shunned in hopes of making things right. ENTPs really don’t like being ignored, and being shunned really is not much better. When someone shuns them the ENTP might at first attempt to figure out why, or make light of the situation in order to move one. If the person won’t explain why they are upset with the ENTP, then they will likely try to move on. While ENTPs don’t outwardly show this, they do care deeply about their friends and loved ones and can become sincerely hurt if they are shunned. ISTJs definitely don’t appreciate being shunned, especially when it comes from someone close to them. At the same time they might not always recognize it, since ISTJs aren’t often focused on the emotions of others. They do care for their loved ones, they just don’t find it natural to pick up on the emotional responses of others, nor do they feel themselves readily connected to their own emotions. ISTJs are more focused on practical ways of helping others, and find it easier to just focus on the things they know and understand. ESTJs can struggle with being shunned and might take this as a challenge to overcome. When someone they care for shuns them the ESTJ might blame themselves, and feel the need to become better. They will likely try to be someone that is more impressive to whoever shunned them, but only if it is someone they care for deeply. ESTJs have a hard time being rejected in this way, and will likely work to get back into the good graces of that individual. ISFJs definitely have a hard time with being shunned and will take this as a major rejection. They might become upset and start to blame themselves when this happens to them. If they feel shunned by someone close to them then the ISFJ will likely try to make amends and figure out what went wrong. If this does not work they might retreat and feel hurt for a while before moving on. They definitely have a hard time not blaming themselves with these types of situations, and will feel like they did something wrong. ESFJs really become hurt when someone shuns them, and will try to make amends. They want people to like them and appreciate them for who they are, but when this does not happen they might blame themselves. ESFJs can sometimes feel like they have done something wrong and will want to fix the situation. When they realize things cannot be fixed the ESFJ will move on and cut ties with the person who shunned or rejected them. ISTPs don’t appreciate being shunned by someone they care for, and will definitely be hurt by this. They will try to make things right if they can, and will attempt to figure out what went wrong. If things cannot be mended then the ISTP will move on, but they will certainly try to make things right. When the ISTP is shunned by someone they are not close to, they feel very differently. They will likely brush this off, and don’t really feel largely affected by it. ESTPs truly dislike being shunned and will often try to overcome this. They will attempt to make things right with that person and will seek new ways to get their attention. They hate being neglected or ignored in this way and will often be very hurt by this. ESTPs want their loved ones to enjoy connecting with them, and have a hard time feeling like they are disliked for something they have done. While ISFPs truly dislike being shunned, they rarely feel like fighting for someone’s attention. At first they might try to reach out, but if the shunning continues they will simply walk away. ISFPs are very internal people, who believe in following their own path without having to constantly look to others. If they are being shunned for their beliefs then the ISFP will simply continue on their own path without those people. There are few things the ESFP hates more than being shunned or ignored. They dislike when someone rejects them in this way, and will often fight to make themselves heard. They don’t handle being shunned very well and will often try to make things right. ESFPs want to be liked by others, and are naturally charming people. When there is someone who pushes them away the ESFP might fight to change their minds for a while before finally moving on.